Are you looking for something to work with your winch and also beef up your truck? Then you need the Go Rhino HD winch guard. 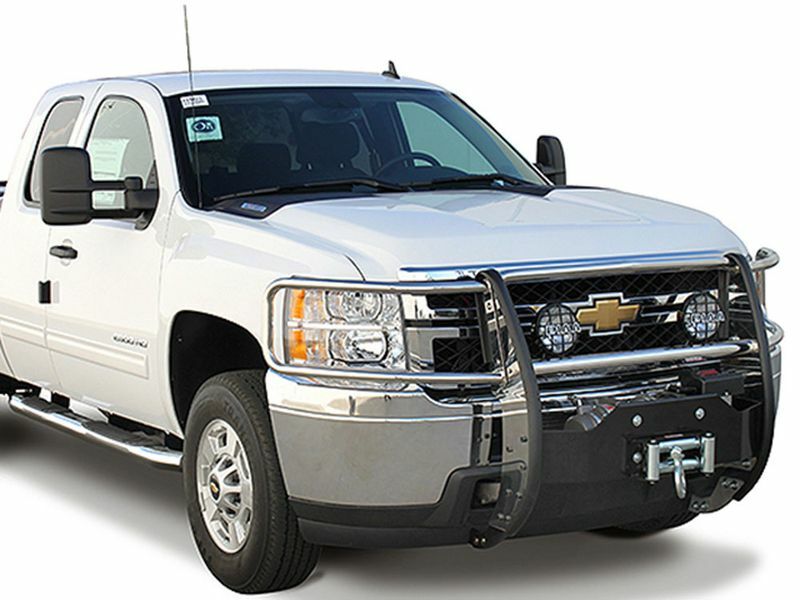 Included with this grille guard comes the center grille guard and brush guards so you have full protection on the front of your truck. The Go Rhino HD winch guard accommodates a winch up to 16,500 pounds, so this is one tough grille guard. These winch guards come with a winch tray installed and will accommodate a variety of winches. Included with this winch guard you will also receive heavy duty mounting brackets and hardware. Installation is a piece of cake, all you have to do is bolt this gnarly guard onto your truck. Also, if you ever get the itch you can add two auxiliary lights to this grille guard because it already has pre-drilled holes for them. The Go Rhino HD winch guard comes in stainless steel and black powder-coat so it'll make any truck stand out. Go Rhino offers a lifetime warranty for stainless steel and a five year warranty for black powder-coat! That's awesome! Go Rhino offers a lifetime warranty on stainless steel products and a five year warranty on black powder-coat products. The Go Rhino HD winch guard is an easy installation, with no drilling required. All it requires for installation is to bolt-on the winch guard to your vehicle. Included for installation are heavy duty mounting brackets and hardware.